Because of the progressive nature of Iyengar Yoga, students with no previous experience in the system begin with Gentle or Level I classes. You learn the fundamentals of alignment and terminology for performance of poses at more advanced levels. You can repeat any level as often as you desire. We recommend discussing your needs with your teacher to help determine the level right for you and when to move to more advanced levels. You can read about the classes on the tabs below. The students in the photos are doing poses typical to the class levels; the poses for all the Levels 1,2,3, Gentle, and Kids classes are shown. Standard poses are adapted to deal with injuries or conditions such as arthritis or fibromyalgia. For new or experienced students who want a slower pace because of limited mobility or health issues. For students with experience in Gentle I or experienced yoga students needing to step back due to injury or illness. Students with no experience can enroll if they are able to get up and down from the floor without assistance and have no major injuries or limitations; excellent for expectant moms, as well. This is the basic introductory class for students new to the Iyengar yoga system. 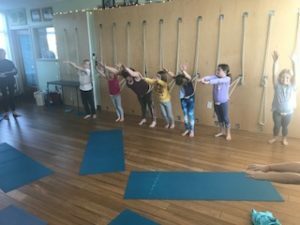 The class focuses on standing poses, forward bends and twists. The class introduces basic inversions and the fundamentals of back-bending. This class is designed for students who have had at least 2 sessions of Level I and feel ready to move on to a few more inversions, basic back-bends, and new standing poses. Poses are held for longer periods of time. The class introduces the headstand. This class is for students with at least 1 year of Iyengar yoga experience and who have strong standing poses. Along with the refinement of the basic poses, the class focuses on regular work on back-bends, inversions and breath. The class introduces the full arm balance. This class is for students with Iyengar Yoga experience at Tree House or other Iyengar Yoga studios. The poses range from basic to more advanced, with students working at their appropriate level. All categories of poses are explored. This class is great for a student visiting from out of town, make-up classes, or challenging yourself to move to another level. Pranayama is the art and science of yogic breathing practices. The class is for those new to the practice as well as more experienced students. Experience with yoga asana is required for the class as they are used as preparation for Pranayama. 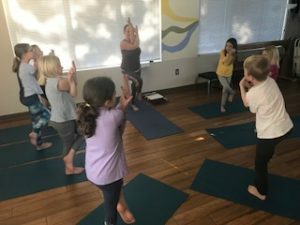 Yoga for kids is fun and playful; it cultivates mindfulness, a positive self-image, focus and much more. All of which carry over to the classroom and daily activities in a child’s life. This class is for children ages 6-10 and will include yoga postures, games, storytelling and time for relaxation. Angela is the primary teacher of these workshops and classes and has over 15 years teaching experience with elementary and teenage children. Level 1: This introductory Iyengar Yoga Meets Qigong class teaches you deep relaxation skills. It’s an antidote in the age of anxiety, designed to relieve stress, enable you to sleep better, and relax at the end of your work week. This class teaches you basic Iyengar yoga poses combined with basic Yi Ren® Qigong breath and energy exercises. We combine gentle standing poses, forward bends, twists, and basic inversions with the basic breath and energy work of qigong. We focus on relaxing, calming your mind for sleep, releasing stress, and grounding and centering in your body for peace of mind. Level 2: The Level 2 class teaches additional deep relaxation skills with a focus on your internal organs. Yoga and Qigong are antidotes in the age of anxiety, designed to relieve stress, enable you to sleep better, and relax at the end of your work week. This class teaches Iyengar yoga poses combined with Level 2 Yi Ren® Qigong breath and energy exercises. Some yoga experience is required. Level 3: Level III continues to teach additional deep relaxation skills with a focus on your internal meridians & deeper relaxation in yoga poses. Level I Yoga & Qigong or Iyengar Yoga & Qigong workshop or instructors consent to take class. Prenatal yoga is designed for a woman’s changing body during pregnancy. As well as strengthening the body and alleviating common physical discomforts, yoga helps create a calm state of mind in preparation for labor and birth. Although classes are not currently offered, teachers are available to teach privately so that you can create your own home practice. Please contact the studio for more information. This class is for anyone who wants to improve their strength and flexibility but has difficulties such as, getting up and down from the floor, knee or hip issues, foot problems; or is recovering from an illness or injury. All poses are done in the chair or with chair support.